MTV has always been at least a bit more in touch with the video game scene than most major cable TV stations. I mean heck, our EIC Stephen wrote for their video gaming site for a time! 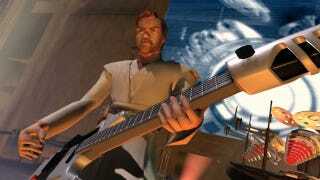 One of the most enjoyable/bizarre things the network ever did was Video Mods, an EA-sponsored series devoted to using video game machinima to make music videos for popular songs. I didn't watch the show regularly at the time, but I've been spending the week going through the videos from the show, and they are amazing. Not only because of how cheesy some of them are, but because of how perfectly "2003" the music is. I don't really think that Taking Back Sunday is all that scary, so this one's go some cognitive dissonance going on. The triumphant chorus playing while the terrifying bunny-head monster freaks out is particularly discordant. This is probably the funniest one, if only because the grey, drab game characters don't match with The Killers' colorful vibe at all. Fun fact about this song: It's like three notes, and most of the song is just one note. And yet it might be The Killers' best song. Huh. Of course it took three games to handle my favorite of all of these—"Let's Get It Started" (AKA "Let's Get Retarded") by the one and only Black Eyed Peas. This was riiiight around the point where the Black Eyed Peas officially became terrible. At least we'll always have "Latin Girls." As silly as these videos are, if they were made with current video game tech they would be amazing. We already see a lot of this kind of stuff on YouTube, but it'd be really cool if someone organized it into a series again. Here's hoping we get to see video game characters perform "Call Me Maybe."